St. Mark's United Methodist Church of Bloomington, Indiana is an inclusive community bringing Christ-like love, healing and hope to all. We embrace the United Methodist ideal of Open Hearts, Open Minds and Open Doors by welcoming those of all races, cultures, faith traditions, sexual orientations, and gender identities. The church office and building will be "closed" on Good Friday, so office staff and custodial staff will not be working that day. The building open for evening worship service for Good Friday. and congregational singing including "Hallelujah" from Messiah. if 9:30am childcare is needed. Please sign your children in for Sunday School in Garton Hall. Many of us watched in in sadness and dismay this Monday past as on live television we saw the Parisian cathedral of Notre Dame burn, presumably of accidental causes, and its majestic spire crash into the building below. I have never had the pleasure of visiting Paris as some of you have. But someone has said that one of the joys of living in Paris is hear the tolling of the great bells of Notre Dame Cathedral on Easter Sunday, as their bright and joyful sounds echo through the streets which are showing the signs of Spring. And while thankfully those bells have been recovered and can be preserved, for now, they have fallen silent. It is a devastating thing when a sound of hope falls silent, and when a center of beauty and dignity is marred. In the Gospel of John, Mary Magdalene's presence in the garden began as a sad search for a fallen beloved teacher. The bell that had caused her to come alive had ceased to ring, and she did not know what to do. But it was not to remain silent, and the Easter faith that began that morning continues to empower the faith of many. Swiss theologian Karl Barth once compared his experience to that of a man who climbed the church tower at night and grabbed a rope for support, only to discover that he has struck the church bell and awakened the whole town. "I did not know," he says "that it was so great a bell." It is a great ringing of this bell that will bring us together on Sunday morning to celebrate in the power of the community of faith. This past Tuesday evening, as a stunned city mourned the loss of a public architectural witness to the Divine, exactly 24 hours after the fire broke out, more than 100 cathedrals across France tolled their bells in solidarity, their peals echoing across a country unified. And on Sunday, we will proclaim our faith with a united voice. We will have two services, one at 8:30 and one at 10:30. The content will be the same in both services, complete with the organ and brass instruments, and the chancel and bell choirs. We look forward to seeing you on Sunday morning. 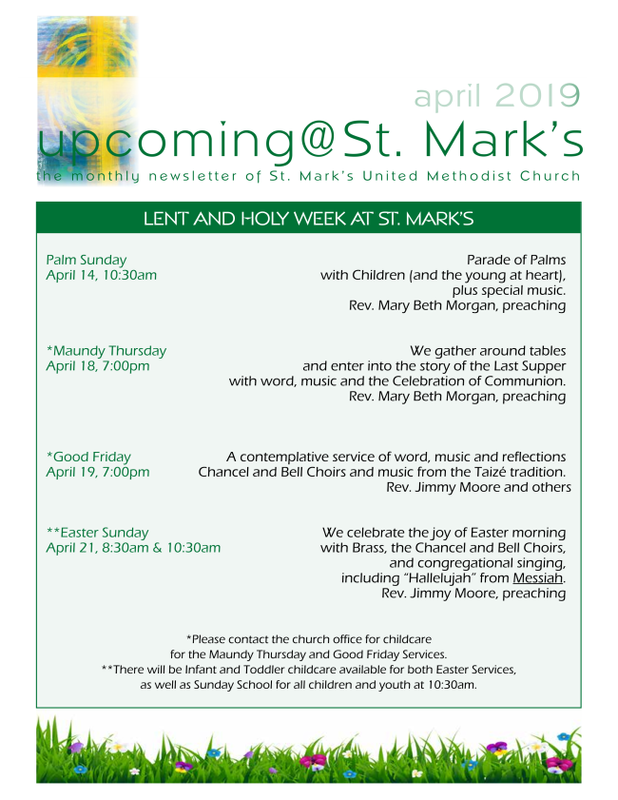 is published each month as an information resource and guide to the activities and events within and around the St. Mark's church community. Copies are distributed at the beginning of each month along with the Sunday worship bulletin or by contacting the church office. 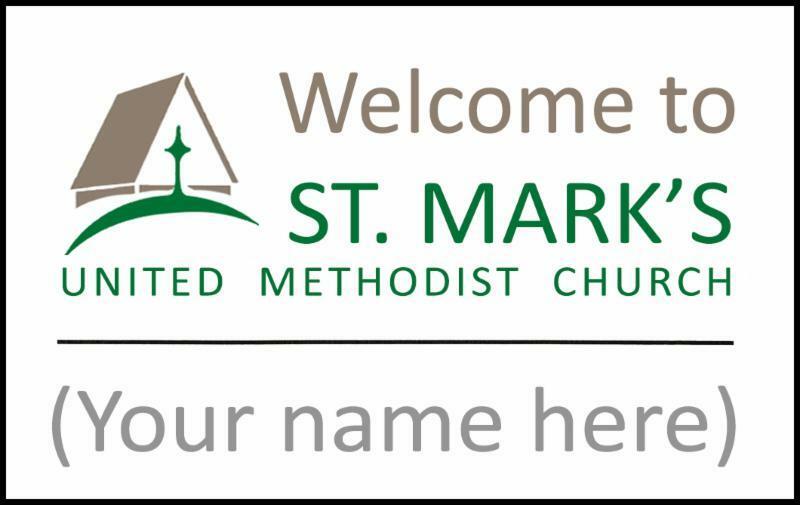 Please send articles or information to be published in the May edition of upcoming@St. Mark's to the church office. Thank you. Contact the church if 9:30am care is needed. Children attending childcare or Sunday School must be signed in and have a name tag from the table in Garton Hall. Please sign in before worship. Each year, we ask families to complete the Family Information form. Paper forms are available at the Sunday School table in Garton Hall. This form should be completed each year for each child (multiple children can be entered on one form). LEARN, GROW, INSPIRE - AND BE INSPIRED! Children’s Ministries is looking for a few more adults to join our teaching team! Our area of greatest need is in our grades 1 & 2 classroom. The Bible story and activities are already planned out and the room is set up. We are looking for individuals to serve only one Sunday a month facilitating the activities, and getting to hang out with some really cool kids! Please contact Alayna at stmarksdcm@gmail.com if you are interested. The Bible Banter class meets in Room 11 each Sunday from 9:30-10:15am. The Scripture text for the morning's sermon is used as a discussion-starter. We look at the passage in its larger context, a bit of Bible-writing history, and some thoughts on the morning's sermon, based on the Scripture the pastor has selected. We leave time to discuss implications of the Scripture for our own lives and delve into topics far afield of the morning's original topic. You are invited to bring some breakfast from Garton Hall into Room 11 and join the conversation. During April, the Nomads class will be viewing and discussing selected lectures by Dr. Bart Ehrman from his series "Lost Christianities: Christian Scriptures and the Battles over Authentication." A professor at the University of NC Chapel Hill, Dr. Ehrman is a stimulating lecturer on this general topic, some aspects of which many find to be both revelatory and controversial. We meet in Room 10 Sundays at 9:30AM and all are most welcome to join us! Pilgrims will meet on Easter Sunday in order to spend more time with families and friends. Carved from a hundred million pounds of stone, soaring effortlessly atop a spider-web of masonry, Gothic cathedrals are marvels of human achievement and artistry. Consuming the labor of entire towns, sometimes taking a hundred years to build, these architectural marvels were crafted from just hand tools and stone. Many now teeter on the brink of catastrophic collapse. To save them, engineers, architects, art historians and computer scientists search the navies, bays and bell towers for clues to how the dream of these heavenly temples on earth came true. NOVA revels the hidden formulas drawn from the pages of the Bible itself, that drove medieval builders ever upward. All are welcome for this video presentation. Call or email the church office for group leaders' contact information. A group of faithful, journeying women meeting weekly to read and discuss books on various topics of faith. Beginning April 25 through May, this group will read UNLEARNING GOD: HOW UNBELIEVING HELPED ME BELIEVE by Philip Gulley. Please join us as we move along our faith journey, collectively and individually, as well as build valuable friendships to support each other through life’s many challenges and joys. Contact the facilitator, Maria Schmidt marschmi@indiana.edu, with questions and to let her know you are coming. During April, the men's discussion group known as Conversations on Life is discussing Richard W. Fox's book JESUS IN AMERICA, a history of Christianity in the USA. Dr. Fox is a professor of history at University of Southern California. The group meets at 1:00pm each Friday in Room 15 at St. Mark's UMC. Visitors are always welcomed. The coordinator for April is Charlie Matson. The Daytime Parents Group encourages parents of very young children to join other parents and children for conversation to support one another through the intense joys and challenges of raising young humans. Bring the kids! There are toys to entertain them while parents converse. Invite friends, and if it is your first time, please contact Abby Brass or Whitney Sullivan for more information. Wolfe titled, "The Wound of Beauty", and may be received by emailing Jimmy Moore at jimmymoore@smumc.church. There will also be copies on the Welcome Desk in Garton Hall. We hope to see you at Pub Theology this month. Playwrights Project, Bloomington Civic Theater, Brown County Theater, and the Knickerbocker Theater (Holland, Michigan). In celebration of Indiana’s bicentennial, she wrote (in collaboration with Elizabeth Mitchell and Danielle Bruce) Resilience: Indiana’s Untold Story. This original play told little-known stories of Indiana’s African-American men and women who made significant contributions to Indiana’s history. In this session entitled The Making of a Story, Dr. DeVane will share with you a story from her arsenal of stories of life in another time and place and talk about why she wrote this story and what lessons are to be learned. All are invited to be a part of this team that strives to help bring the Open Minds, Open Hearts, Open Doors message of St. Mark’s to the LGBT+ community. Come join us on Wednesday, April 24 at 7:00pm in Room 10. For more information, contact Mark Cox (markymarkcox@aol.com) or Mary Beth Morgan at the church office. The Quarryland Men’s Chorus (QMC) will present their Spring concert here at St. Mark’s on Saturday, April 27 and Sunday, April 28. The title is “Historically Speaking: A Musical Romp Through Gay Culture with the QMC. Prices range from ten to twenty dollars, while children 12 and under get in free. Tickets are on sale by contacting chorus members, the Buskirk Chumley box office, or the Quarryland website, www.quarryland.org. (You can find the link to this website on the St. Mark’s website.) All remaining tickets will be available at the door. Quarryland Men’s Chorus is an established, respected partner in the region’s art scene. In addition to providing a positive performance-based community for gay and bisexual men and their allies in South Central Indiana, the Chorus fosters talent, fellowship, pride, and understanding through excellence in vocal music. This spiritual support group for patients facing cancer or other chronic diseases, along with family members and caregivers focuses on spiritual support with a Christian and Methodist approach. Our goal is to help each of us thrive on the days we can ... and survive on the days we are not sure we can. And do all of that in faith. Meetings take place every other Monday. Group Facilitators will be Dr. Brandt Ludlow and Craig Stewart. Development of the Celtic culture started in Southern Germany and Austria about 2500 years ago with expansion over Europe and to the British Isles during the next 200 years. The Romans called these people Gauls and during the time of Christ, Gauls were also living in central Turkey and were referred to in Paul’s letter to the Galatians. The Romans brought Christianity to England and some brave Monks sailed from England to Ireland to convert the pagan Celts. They had little success until Maewyn Succat came to the “Emerald Isle” in 431CE who, after training as a monk, took the name Patrick and we know this man as St Patrick. St Brigid established several religious communities in Ireland, the most famous at Kildare which comes from the old Irish name of Cill Dara meaning Church of Oak. St Columba, who also spread Celtic Christianity into Scotland and northern England, had the skill of making illuminated manuscripts. This skill was passed down to his followers at Iona and it was there that the treasured Book of Kells was created and somehow saved from the Viking raids that began around 780CE. Thankfully some aspects of Celtic Christianity live on and resonate with the modern Green Movement or what we Methodist call Creation Care. Celtic Saints. So, grab your coffee and enjoy Charlie Matson’s insightful look into Irish history. St. Mark’s pet lovers are invited to join our small group, Buddies of St. Francis, for a fun walk in the woods with our dogs in Brown County State Park. Bring leashed pets on this hike, and meet the group parking lot at Ogle Lake at 4:00 PM. We look forward to having you and your furry friends join us. VACATION BIBLE SCHOOL (VBS) 2019: "LOVE YOUR NEIGHBOR"
Jesus commanded us to “Love your neighbor” but who are our neighbors and how exactly do we show love to those we know, those we differ from or those we do not know? We will have fun exploring all of those questions and so much more! Each day, children 3 years through grade 6 will explore these themes through story, song, art, and play. All activities will be age-appropriate and fun! The week will culminate in a special VBS worship service Sunday morning, June 23rd, at 10:30am. years and younger. Participant registration and volunteer forms are available outside Alayna Gray's office in Garton Hall, or register online to volunteer or register children 3 years - grade 6. For more information, contact Alayna at stmarksdcm@gmail.com or call her at 812-332-5788.
wear a name tag, please. Need a name tag? Click here! Then pick up your name tag from the name tag tables in Garton Hall.